State Rep. Ryan Mackenzie joined his colleagues in taking the oath of office on Jan. 1 to serve as state representative of the 134th Legislative District. 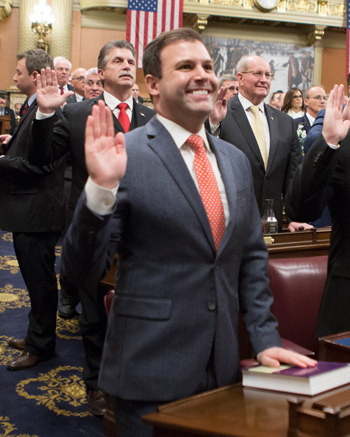 HARRISBURG – On New Year’s Day, state Rep. Ryan Mackenzie (R-Lehigh/Berks) took the oath of office as state representative of the 134th Legislative District covering parts of Lehigh and Berks counties. This is Mackenzie’s fifth term in office. He has also been reappointed a House Majority Deputy Whip for the 2019-20 session. Last session, Mackenzie had three bills signed into law. •	Act 4 of 2017, which directs emergency responders to take stroke victims to the nearest stroke center qualified to treat the severity and type of stroke occurring, instead of simply the nearest “primary stroke center,” which may not be prepared to handle the type of stroke the patient is experiencing. •	Act 38 of 2017, which requires checks to be made payable to the name of the local tax collector along with the office, title, or position and be deposited into a separate bank account only used for tax money. •	Act 24 of 2018, which created the Pennsylvania Maternal Mortality Review Committee, charged with identifying pregnancy-related deaths, overseeing the review of these deaths, recommending actions to help prevent future deaths, and publishing review results. Shortly after being sworn in to office earlier this month, Mackenzie has already introduced resolutions designating Jan. 23 as Maternal Health Awareness Day and Jan. 28 to Feb. 1 as Tax Identity Theft Awareness Week. For more information and legislative updates, please visit Mackenzie’s website at RepMackenzie.com, his Facebook page at Facebook.com/RepMackenzie or his Twitter feed at Twitter.com/RepMackenzie.